It's a fact: our skin changes in summer and unfortunately, for the most part, it's not for the better (we're looking at you pigmentation, wrinkles and sunburn...) The warmest months call for a seasonal update to your beauty bag. 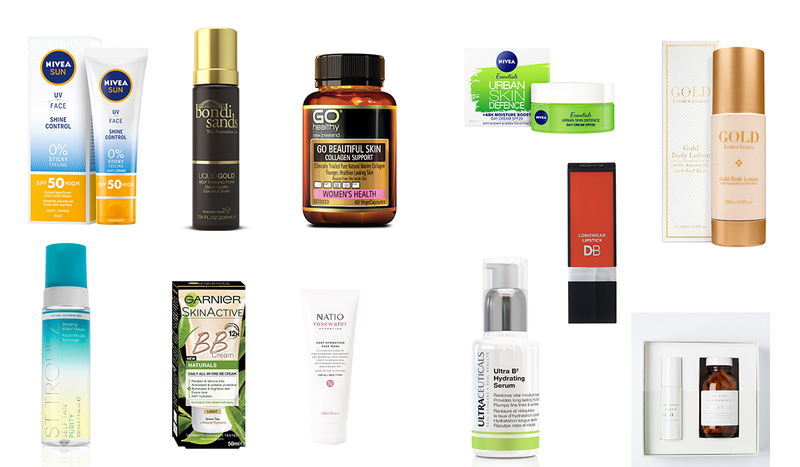 Check out our tips for managing the sun and heat with hardworking products for face and body. Long days under the blazing sun can leave skin feeling tight and parched, so applying a thick layer of a deeply hydrating face mask is a pampering and practical treat. A line extension of the popular Rosewater Hydration range, Natio’s Deep Hydration Face Mask,$23.50, mask infuses skin with vital nutrients when applied in a thick layer and left for at least 10 minutes. A lightweight tint is often all you need on your face in warmer weather for an evened-out complexion and healthy glow. BB cream is a great option for good hydration and antioxidant and pollution protection, plus Garnier’s latest version, Skin Active Naturals BB Cream, $17.49, contains 90% natural origin ingredients. The beauty supplement business is positively booming – it makes so much sense to treat all the skin all over your body, not just your face, especially in summer. Marine collagen is a renowned ingredient for supporting beauty from the inside out, helping to restore and protect skin that’s lost its tone and texture over time. We love homegrown options Go Healthy Go Beautiful Skin Collagen Support, $49.90 and re.skin, $169.95. When in doubt, get glowing! For special nights out and summer soirees, apply a body lotion with a subtle shimmer, like Linden Leaves Gold Body Lotion, $64. Light reflecting pigments make limbs appear longer and will always look fabulous in photos. As we all know, or really should by now, the only safe tan is a fake one and there are a veritable plethora of shades, formulations and finishes to choose from these days. Top tips: Always exfoliate and remove hair the day prior and use a mitt for the best streak-free application. We’re loving these two new additions for the beauty counter this summer so far, St Tropez Purity Bronzing Water Mousse, $59.95 and Bondi Sands Liquid Gold Foam, $29.99. Go for a poppy lip. Classic red mixed with vibrant orange creates the perfect modern summer shade. Look for a high shine formula with intense pigment and good moisturisation like DB Longwear Lipstick in Orange Poppy, $11.99. Do you have a beauty product you swear by during summer? Coffee scrub or some sort of scrub to buff away dry skin and of course keeping hydrated with lots of water. Does BMI really matter these days?